On average, people spend half an hour of their day standing in lines. And the population of the USA stands in lines for 37 billion hours a year. Can you believe this? Scientists were shocked by this number too, so they came up with some tricks that may help you to minimize the time you waste standing in line at the supermarket. We at Bright Side suggest you spend your time more productively, and that’s why we’d like to share these tips with you. 1. Get behind a shopper who has a full cart. You probably think that this doesn’t make any sense. However, researchers prove that this is actually true. Meyer found out that if you get behind a person who has 100 items in their cart you will spend 6 minutes standing in line. 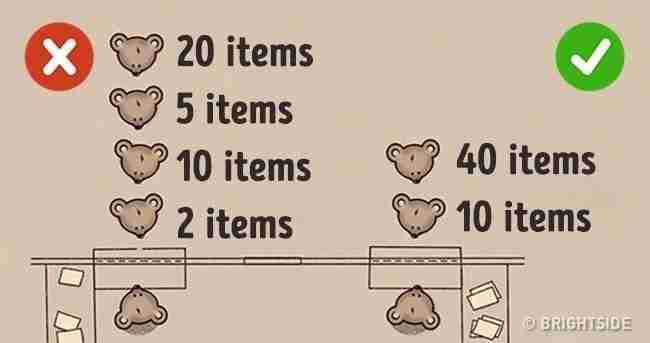 If you get in a line with 4 people who each have 20 items, it will take nearly 7 minutes. This means that the line with fewer people who have full carts moves faster. 2. Lines on the left move faster. As most people are right-handed they tend to veer to the right. That’s why you had better get in a line to your left. 3. The cashier is female? Great! As a rule, female cashiers service customers faster and more effectively. 4. Check what the customers ahead of you are buying. This doesn’t show your curiosity. You need to do this because ringing up items in solid packagings and glass containers (and even items of one brand) doesn’t take much time. It takes more time to scan a barcode sticker on paper and plastic bags, as sometimes a cashier has to enter it manually. So the person who only has a bottle of milk and soda in their cart will be serviced faster than a customer with a bag of frozen vegetables. 5. Don’t pick a line that snakes around a corner. According to research, a cashier who doesn’t see the whole line services customers slower.